The team of scientists responsible for capturing the first image of a black hole includes an alumna from St. Paul Academy and Summit School. Dr. Sera Markoff '89 is an astrophysicist at the University of Amsterdam and is part of the "Event Horizon Telescope" team, a group of scientists who oversee the network of 10 radio telescopes spread across the planet that function as a single receiver and were able to capture the remarkable image. Markoff was one of the five members of the team who was on stage (seated at far right) during the news conference in which the image was first shown to the press and the world on Wednesday, April 10. 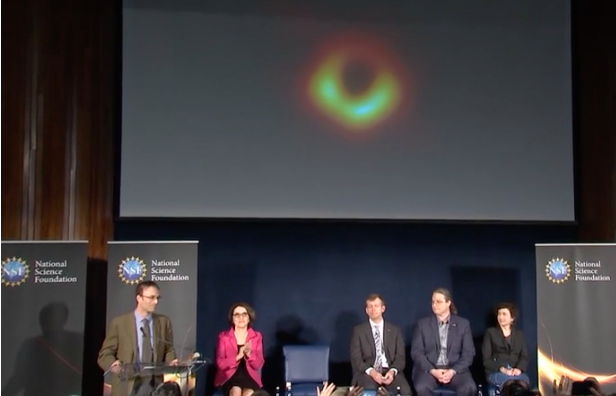 She is also quoted extensively in the Washington Post's story on the image: "Markoff said she and other scientists got their first look at an early image of the M87 black hole last summer, and although it generally matched what the computer models had predicted a black hole would look like, she was still in awe. 'The impact of really seeing it for the first time, it was really surprising, kind of emotional, [Markoff] said. 'I walked around with the image on my cellphone and I kept pulling it out and looking at it at random moments. And I couldn’t tell anybody'." After graduating from SPA in 1989, Markoff attended the Massachusetts Institute of Technology, earning an undergraduate degree in Physics. She then earned a Ph.D. in theoretical astrophysics at the University of Arizona. She is now a Professor of Theoretical High Energy Astrophysics at the University of Amsterdam. A 2013 profile of Markoff in SPA Magazine noted that her work focuses on the processes that occur around black holes: "I like to tell people I get paid to do science fiction, which is a joke--but not too far from the truth," Markoff says in the profile, which also included some of her remembrances of her time at SPA. "SPA was all about learning and respect for learning, and that was an environment I really thrived in...it honestly never occured to me--either at SPA or afterwards--that I couldn't do anything that interested me." Read the 2013 profile from SPA Magazine.